A site-specific installation, As if they fall, was installed in 6018 North gallery in the Edgewater neighborhood of Chicago, a historical building which had been flooded in 2014. As a result, the entire structure of the building had been affected, damaged and the humidity had caused pieces to fall, and created empty patches in tile, paint, and flooring. 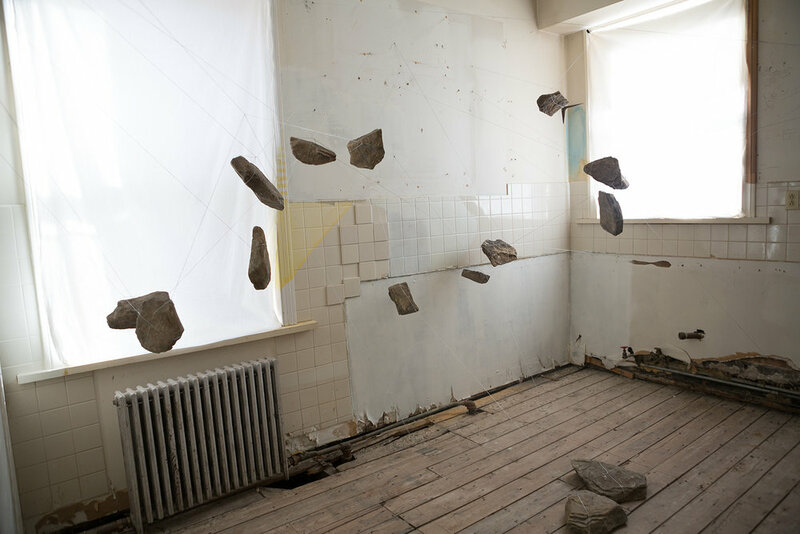 Emptied out and solidified, interrupted and intuitional, dwelled and abandoned, clung on and suspended, “As if they fall” is a spatial experience and intervention which can be installed in and correspond to any other space. I have installed this in my former studio at the School of the Art Institute of Chicago as well as the 6018 North gallery.